President Tayyip Erdogan has dubbed the New Year’s Eve shooting spree that left 39 people dead at an Istanbul night club “dirty games,” vowing Turkey will fight to the end against all forms of terrorist attacks. A manhunt for the attacker is still ongoing. “As a nation, we will fight to the end against not just the armed attacks of terror groups and the forces behind them, but also against their economic, political and social attacks,” he promised. Erdogan linked the attack to the situation in the region. Turkey neighbors Syria, where Ankara is conducting a military operation called Euphrates Shield, which is said to be targeting Islamic State (IS, formerly ISIS/ISIL) and YPG forces. Police are still looking for the suspect who opened fire in the well-known Reina nightclub in Istanbul’s Besiktas district. "A manhunt for the terrorist is underway. Police have launched operations. We hope the attacker will be captured soon," said Interior Minister Suleyman Soylu. There is no clarity yet on who was responsible for the attack, Turkish Prime Minister Binali Yildirim said. "Some details have started emerging, but the authorities are working towards a concrete result," Yildirim told reporters. No group has yet come forward. The PM has denied reports that the attacker was dressed as Santa Claus. “There is no truth to this,” he told the media, as cited by AP. Yildirim said the “armed terrorist” first attacked security personnel outside the club, before proceeding inside and shooting people at random. The attacker then abandoned his gun inside the venue and escaped by “taking advantage of the chaos,” the minister said. At least 15 of the 39 people killed were foreigners, and four of the 69 injured are said to be in serious condition. Nationals from Morocco, and Libya are said to be among the victims, according to Turkish officials. An Israeli national Leanne Nasser, aged 19, a Frenchwoman and her husband from Tunisia, two Lebanese, three Jordanians and five Saudis have also been confirmed dead. While the Belgian Foreign Ministry reported on Twitter that it fears one of the deceased may be from Belgium. According to officials, the attacker used a "long-range weapon" to "brutally and savagely" fire on people. The suspect escaped the scene by changing clothes at the club after the attack, according to reports on Turkish media. There have also been rumors that there was a second attacker, but officials are now just talking about one terrorist. The news received a strong international response, as world leaders, including those of Poland, Iran and Greece, condemned the attack. “It’s hard to imagine a more cynical murder than the killing of peaceful people amid a New Year celebration. But the concepts of human morals are absolutely alien to terrorists. Our common goal is to resolutely rebuff the terrorists’ aggression,” Russian President Vladimir Putin said. US President Barack Obama has offered to help Turkey with the investigation, according to a White House statement. The owner of the Reina’s nightclub, Mehmet Koçarslan, claimed that extra security measures had been taken prior to tonight's incident after the club received a warning about a possible attack. He said that the information had come from US intelligence services. “US intelligence warned about such an attack about one week or 10 days ago – and measures were taken, including [on] the sea front. And look what has happened,” Koçarslan told Turkish daily Hurriyet. As many as 600 people were thought to have been inside the club at the time of the attack. 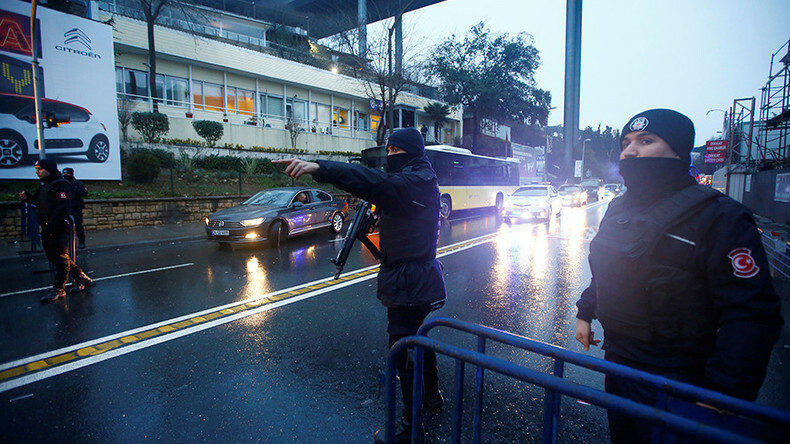 The Hurriyet newspaper cited witnesses as saying the attacker shouted in Arabic at Reina. Some people jumped into the Bosphorus waters to save themselves and were later on dragged out by police.